LIKE A CHINESE TATTOO nominated for a Bram Stoker Award! We are pleased to announce that the latest title from Dark Arts Books – LIKE A CHINESE TATTOO – was nominated for a Bram Stoker Award for Superior Achievement in an Anthology. The Bram Stoker Awards are awarded every year by the Horror Writers Association for superior achievement in horror. This year, the awards will be handed out during the Stoker Awards Weekend, June 12-14 in Burbank, CA. Dark Arts Books will be in attendance, and will be hosting a table in the dealer’s room during the Stoker Weekend. We congratulate all the nominees, and especially the authors from LIKE A CHINESE TATTOO – Cullen Bunn, JA Konrath, David Thomas Lord and Rick R. Reed. What do Gary A. Braunbeck, Mort Castle, Gemma Files and Cody Goodfellow have in common? 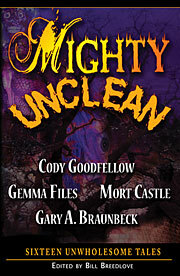 Dark Arts Books is proud to announce that its fifth title—the anthology Mighty Unclean—is set to be released at the 2009 Bram Stoker Awards Weekend, June 12-14, in Burbank, CA, and will feature stories from authors Gary A. Braunbeck, Mort Castle, Gemma Files and Cody Goodfellow. As usual, Mighty Unclean will follow Dark Arts’ template of combining the best new fiction along with uncovering outstanding reprinted material from each of the four authors, and will be edited by Dark Arts Co-Publisher Bill Breedlove. One of the new story highlights is sure to be Gemma Files’ “The Speed of Pain,”—a sequel to her earlier work, “The Emperor’s Old Bones,” which won an International Horror Guild Award for best short story. Cody Goodfellow, whose novel “Jake’s Wake” (with John Skipp) was recently published, has a story that Everson thinks will be garnering quite a bit of attention. Add in the contributions from multiple-Stoker Award winner Gary A. Braunbeck and living legend Mort Castle, and this release looks to be Dark Arts’ most compelling book yet. Mighty Unclean is available for preorder now.